The gradual training begins with the practice of generosity, which helps begin the long process of weakening the unawakened practitioner’s habitual tendencies to cling — to views, to sensuality, and to unskillful modes of thought and behavior. This is followed by the development of virtue, the basic level of sense-restraint that helps the practitioner develop a healthy and trustworthy sense of self. The peace of mind born from this level of self-respect provides the foundation for all further progress along the path. The practitioner now understands that some kinds of happiness are deeper and more dependable than anything that sense-gratification can ever provide; the happiness born of generosity and virtue can even lead to rebirth in heaven — either literal or metaphorical. But eventually the practitioner begins to recognize the intrinsic drawbacks of even this kind of happiness: as good as rebirth in wholesome states may be, the happiness it brings is not a true and lasting one, for it relies on conditions over which he or she ultimately has no control. This marks a crucial turning point in the training, when the practitioner begins to grasp that true happiness will never be found in the realm of the physical and sensual world. The only possible route to an unconditioned happiness lies in renunciation, in turning away from the sensual realm, by trading the familiar, lower forms of happiness for something far more rewarding and noble. 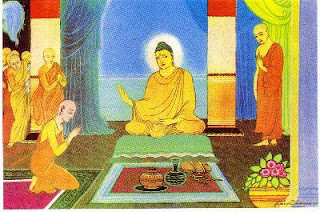 Now, at last, the practitioner is ripe to receive the teachings on the Four Noble Truths, which spell out the course of mental training required to realize the highest happiness: nibbana. Many Westerners first encounter the Buddha’s teachings on meditation retreats, which typically begin with instructions in how to develop the skillful qualities of right mindfulnessand right concentration. It is worth noting that, as important as these qualities are, the Buddha placed them towards the very end of his gradual course of training. The meaning is clear: to reap the most benefit from meditation practice, to bring to full maturity all the qualities needed for Awakening, the fundamental groundwork must not be overlooked. There is no short-cutting this process. Countless students over the centuries have invested their time and energy grappling with the question, “Is Enlightentment ’sudden’ or is it ‘gradual’?” These and other passages from the Canon make the Buddha’s own view on the matter quite clear: The mind develops gradually, until it is ripe to make that sudden leap to Awakening. Deal ever for the farmers. Epoch-making decisions in the best interest of the farmers. · Under the new policy, each farmer whose land is to be acquired, shall receive ab annuity of Rs.20,000 per acre, for 33 years in addition to the compensation amount. · Assured increase at the rate of Rs.60 per acre per annum on annuity of Rs.20,000 per acre per annum, payable every year in the month of July. · In the case of a farmer unwilling the annuity, he/she shall be given a lump-sump Rehabilitation Grant at the rate of Rs.2,40,000 per acre. · In the event of loand acquisition for a company, the farmer shall have the option of a share in the company equivalent to 25% of the lunp-sump rehabilitation grant payable to him. · If land is being acquired under any ‘Land for Development scheme’, the affected farmers shall be allotted 7% of the acquired land for residential purposes. The issued plot shall have a minimum land area of 120 sq.meters and maximum area limit shall be set by related Authority. · One member from each of the families to be rendered landless completely, due to land acquisition under the “land for development” project, will be provided with employment, consistent with his/her qualification, in the concessionaire company. · Provision of 17.5% reservation in the allotment of plots, on the acquired land to the affected farmers, in the event of any land acquisition by the development authority for its housing schemes. · Land acquisition shall be done under the “Karar Niyamavali”. The Hon’ble Chief Minsiter is fully alive and sensitive to the problems of the farmers, whose well being has always been her top priority. · Under the guidance of the Hon’ble Chief Minister, the state government has always been protective of the interests of the farmers and taken all possible measures to address their problems. · The Hon’ble Chief Minister is clearly of the view that the development of the country is not possible without the prosperity of the farmers. With this end in view she has initiated many important and positive steps. The new policy of land acquisition by Uttar Pradesh Government, conceived with regard to the good of farmers, is decidedly the best and the most forward looking in the country. 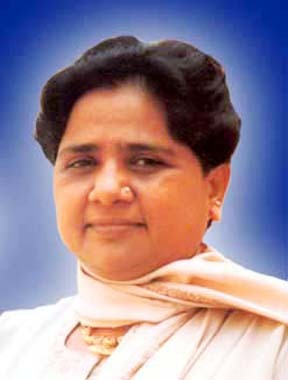 Undoubtedly, no other state in the country has got such a forward looking policy for the relief and rehabilitation of the families affected by the process of land acquisition, as has been done in the state of Uttar Pradesh under the dynamic leadership of Hon’ble Chief Minister of the state Ms.Mayawati Ji. The Uttar Pradesh police is banking on community policing to nip any possible communal flare up post September 24 Allahabad high court verdict on Ayodhya title suit. “There is no Naxal activity in the state in the past five years due to success of community policing formula. For the first time, we are going to experiment it in the entire state by involving all the sections of the society to maintain law and order after high court verdict on Ayodhya title suit,” additional director general law and order Brij Lal told PTI. During meetings to review security arrangements across the state by principal secretary home, director general of police and the ADG, officials in districts have been asked to bank on peoples’ support as police cannot reach “everywhere everytime”. “There are government employees, teachers, retired persons in every area and with their support we can check occurrence of any anti-social activities,” the ADG said. A communication diary has been prepared in every district having number of credible and responsible persons of the area, who can help police, he said. The senior officers randomly make a call to these persons and remind them of their duty to help police and maintain communal harmony, he said, adding that the support they were getting was enthusiastic. The diary also included name of local “dharm gurus” including maulanas and pujaris of temples and village heads to issue appeals to maintain peace and communal brotherhood, the ADG said, claiming that the idea would certainly click. The civil security committees have also been constituted at all the village and mohalla level for keeping an eye on the situation and alert the force in case of any trouble, he added. “Besides, we have also prepared a list of suspicious people, including those having criminal background, and put them on scanner. All of them are on our radar,” Brij Lal said. LUCKNOW: In a unique show of communal harmony, a large number of Muslims and Hindus have joined hands in Uttar Pradesh’s Bijnor district to take out peace marches ahead of the Ramjanmabhoomi-Babri Masjid title suit verdict Sep 24. Under the banner of Sarvadharma Ekta Parishad, over 100 members from both the communities are carrying out peace marches in parts of the district. “The main objective behind such marches is to give a social message of unity among the masses in view of the upcoming verdict in the Ayodhya case,” Mufti Shamoom Qasmi told IANS on telephone from Bijnor, some 300 km from Lucknow. “The peace marchers intend to ease the tension related to the judgment which in any case should not affect Hindu-Muslim relations. Taking this into account, we are carrying out the marches and appealing to members of both the communities to maintain peace after the verdict,” he added. People from all walks of life have come forward to join the parishad which has already organised two peace marches this week in Binjor. “Teachers, journalists, businessmen, college students, house wives, retired government officials and people from other fields joined the marches,” said Naveen Kumar, a local journalist in Bijnor. “Till now we have carried out peace marches at Shastri Chowk and Qasibaada area and would cover several other areas of the district in the coming days,” he added. Members of the parishad believe that the peace marches would go a long way in fostering Hindu-Muslim relations. “We definitely feel privileged after getting associated with such a noble mission. If residents of other districts in Uttar Pradesh too carry out such an exercise, the bonding between the two communities will grow stronger,” said Jai Narain Arun, a resident of Naangal area.